Today Gourmet | Gourmet Cooking Made Easy! Your steaks are sizzlin' on the grill, and you want them perfectly cooked. But checking those tender cuts of meat isn't exactly something you can eyeball. Instead of guessing, try a quicker, more precise method. 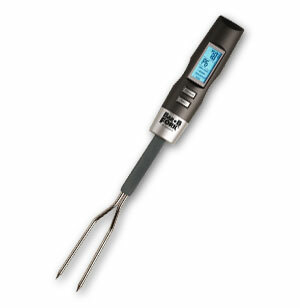 Use your handy new Digital BBQ Grilling Fork to check the doneness of whatever you're grilling. Measuring both in Fahrenheit and Celsius, the BBQ Fork has six pre-set levels for beef, veal, lamb, pork, chicken, and turkey. Just pierce the meat, and with one touch of a button, find out the temp via an easy-to-read digital screen. The cooking chart on the back of the fork indicates temperatures for various degrees of doneness. Use this smart tool when you're cooking via oven or microwave, too. It'll be a lifesaver when you're roasting that Thanksgiving turkey. The only guess you'll be making today is, "Guess I need this tool." © Copyright 2019. All Rights Reserved. Other terms, conditions, and restrictions may apply.